Wedgewood Stole a Point with Little Help in the Third · Let's Go Amerks! The Rochester Americans extended their point streak to nine games on Wednesday night against the Syracuse Crunch thanks to their goalie Scott Wedgewood. A game that Wedgewood thought was one of his best games of the season. Unfortunately the game ended in a shootout loss after what may have been one of the worst third periods ever. Taylor Leier scored the only goal of the game for the Amerks at 1:14 of the first period with an assist from Kevin Porter. 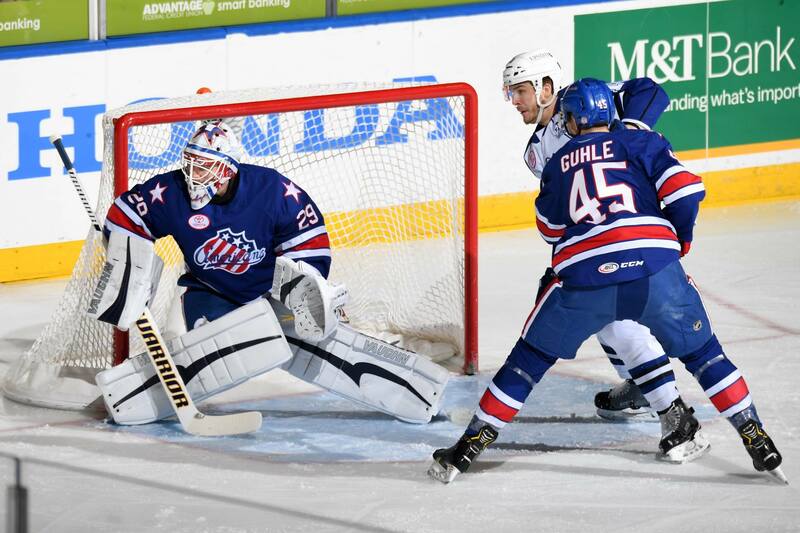 As a penalty to Eric Cornel expired the Amerks gained possession of the puck and took off down ice. A quick shot from Leier off a pass from Porter went off a Crunch player and into the net. One other highlight of the first 40 minutes was the Rochester penalty kill with another perfect night. The Crunch had five power play chances, including a five minute major to Dalton Smith, but the Amerks were able to keep them off the scoreboard. The last time a goal was scored against the Amerks PK was on January 11th in the second period. Since then they’ve gone 28/28. The major to Dalton Smith was questionable and Chris Taylor was at the edge of the bench having a good discussion with referee (and former Amerk) Corey Syvret. As the puck left a Crunch players stick he was hit by Dalton Smith which was interference but it wasn’t a major in any way. Corey Conacher scored at 11:47 of the third period to tie the game and without Scott Wedgewood the game would’ve been lost in regulation. He gave them a chance but they never really had a chance. Now for two ugly stats from the third period – one shot and 68 seconds of offensive zone possession. The only shot on goal for Rochester in the third period was Dalton Smith clearing the puck from the defensive zone off the boards and it managed to go on net with only 2:19 left to play in regulation. That’s it. One shot. Eric Cornel had one shot attempt with 69 seconds left in the third period but it was deflected over the net by a Crunch player. As for possession time, Rochester only controlled puck in the Syracuse end for (unofficially) 68 seconds in the third period. It was clear to anyone at or watching the game that Syracuse dominated the third period but that number proves it. I watched the third period over again and used a stopwatch to calculate how much time the puck was controlled by Rochester across the blue line and that’s all it was. There were attempts to enter the zone or dump the puck in but every time it resulted in a turnover. I used the word unofficially because it was done manually and isn’t a stat that is provided. It was a team effort. Every line played. Every line failed. Scott Wedgewood was stellar with nine saves in the final 20 minutes and it carried over into overtime. Rochester had a man advantage for over two minutes of overtime with the delayed call and then the actual penalty. With the man advantage they were shut down by Syracuse. Victor Olofsson and Taylor Leier had opportunities in the shootout but didn’t score, each player shot wide to the right of the net. Cory Conacher and Alexander Volkov shot for Syracuse and each player scored for the win. “They’ve outplayed us both third periods and I’m not very happy about that,” Chris Taylor said after the game referring to the last two games against Syracuse. That’s back to back losses against Syracuse, games in which Rochester had the lead going into the third period. Memories of the 2018 playoffs when Syracuse dominated the pace of play and swept Rochester out of the playoffs. With seven games remaining in the regular season between Rochester and Syracuse there’s one team that has a lot of confidence looking forward. Rochester extends their point streak to nine games with a record now of 6-0-1-2 but at the same time Syracuse extends their winning streak to seven games. Remi Elie played his first game since being assigned to Rochester and it looked like he wanted to be there. Zach Redmond is probably to return on Friday. He’s missed five games now with a lower body injury. Alex Nylander was out on Wednesday night with a lower body injury. He was hurt in practice on Tuesday after taking a hit. Tyler Randell and Nathan Paetsch were the two healthy scratches. Andrew Oglevie has returned to skating with the team in a non contact jersey.